No one likes making mistakes at work. If we are honest we admit that we make mistakes and sometimes more often than we would like to admit. But we need to be able to admit when we have made one. Not being able to do so will tarnish our integrity. There are two sides to a mistake when it is found. Either you found that one has been made or you made it and need to admit it to your supervisor. Workplace mistakes need to be handled properly. If not it can cause an even bigger problem for the parties involved than the original mistake. Let’s start with the mistake being your fault and it was brought to your attention by either a co-worker or supervisor. What should you do first? Start by listening to what they are saying. This can be very hard because your mind is coming up with what you are going to say back to them before you have even finished hearing them out. After you have heard what they have said then “explain” your side. You may have realized that you made this mistake and were just waiting to see if someone noticed or you may not have even realized that you made a mistake at all. If you did know that you made a mistake and did not come forward first, that is a BIGGER mistake on your part as this reflects on your integrity, which is hard to repair and I will address that in a moment. 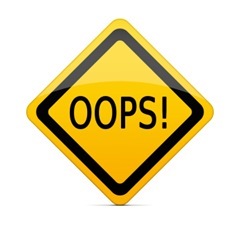 If you did not know you made a mistake, then this is what is called an “honest mistake.” The next step you need to take is to state what you have learned from it and how you are going to ensure that you don’t make the same mistake again. Be professional, and move forward. If you had knowledge of your mistake and did not fess-up to it you have tarnished your integrity. You need to give a good explanation (if there is one) as to why you felt it was worth hiding the mistake instead of addressing it and taking care of it before someone else found out. The best thing that you can do is to apologize for not coming forward when you realized that you made a mistake and admit that you were wrong. Explain what you have learned by the experience and ask that you be giving the chance to make things right. Reassure your supervisor or employer that it will not happen again, then be true to your word. Only time and proof that you learned a lesson, will allow your integrity to shine again with this person. Whether you are the one who made the mistake or the one who found it remember we are all very capable of making mistakes. It is the way that we handle them that speaks volumes about the type of person we really are. This entry was posted on Thursday, April 23rd, 2015 at 8:00 am by Tina Del Buono, PMAC. Filed under Communication, Employee Training, Leadership, Manager Topics, office management, Self-improvement. You can follow any responses to this entry through the RSS 2.0 feed. Both comments and pings are currently closed.